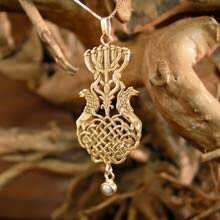 In response to requests for all kinds of personal amulets and tremendous interest in Kabbalistic jewelry, I began to search for additional symbols with meaning from ancient esoteric Judaism. The Menorah is the most ancient symbol of Judaism. According to the Torah, Moshe received the symbol from G-d, while wandering in the desert. The Menorah itself was made of pure gold that is a noble metal that does not change and withstands the damages of time and therefore represents eternity. The seven branches of the Menorah represent the seven days of Creations and are directly connected to the structure of the seed of life. The seven circles that cross each other represent a mathematical geometric symbol of the universe and all of creation. The seven branches represent also the seven planets that were known in the ancient world. The Menorah has 7 branches. The number seven is a sacred number in Judaism and appears countless times in Jewish Mysticism and in other cultures too. In Judaism the Shabbat (the seventh day) is a Sacred day and every seventh year is Shmita year in which it is forbidden to work the land. The lions on the two sides of the Menorah are the ancient symbols of tribe of Judah . 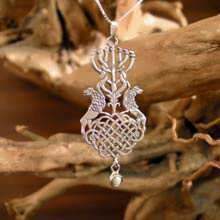 The bottom of the pendant is inlaid with the cat’s eye stone - an ancient remedy for abundance and success. When Moses asked The Burning bush of the name of G-d, he receives a rather abstract and surprising answer (in comparison to a time where most of the world was involved in pagan rituals) "I will be what I will be", something that is existence itself, devoid of any description or definition. The Tetractys of Pythagoras is a triangle and it has 4 lines that contain 10 points. This symbol is the basis for all the mathematics and the geometry and the laws of the universe. 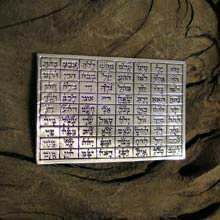 If we take the Tetragrammaton and place its letters on the Tetractys and we add up its numerical value, we will receive the number 72 that appears in the ancient sources of the Kabbalah as 72 names (72 names of G-d). According to ancient traditions if we take the central verses in the Book of Exodus -14 and divide them in a certain way we will receive 72 combinations of three letters. If we connect their combination we will receive a name of 216 letters. According to Kabbalistic tradition, these combinations are the name or the formula by which means, among other things the world was created. The source of the formula is not known and also the way to use it has been lost over the years. These combination of letters appear in ancient Jewish amulets. 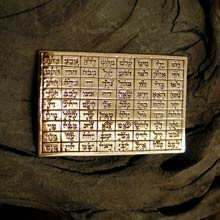 The silver or gold tablet of the 72 names is meant for carrying it as an amulet for protection for defense, healing and success. The search for the ultimate equation or formula that is present in the entire universe has always fascinated mathematicians and physicists. To conclude, I am including a link to one of my favorite stories. It is a story by Arthur C. Clarke, "The Nine Billion Names of God"